by Stacy Dawn: Demystifying Deeper POV Part Three: Bodies, Eyes, and Flies--oh my! 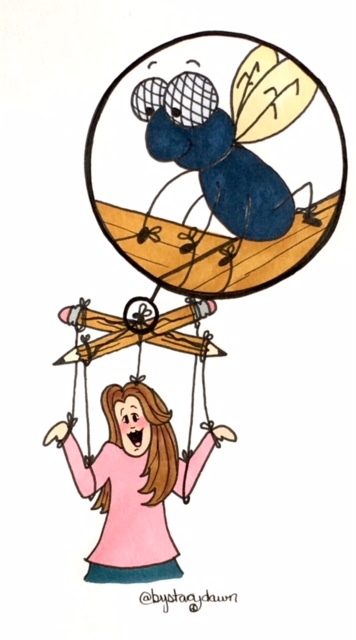 This week, we are going to swat the Fly’s Telling POV by snipping its puppeteer strings so your main characters can take back control of their own own bodies and descriptions. Disjointed body parts are the first sneaky way the pest tries to pull those marionette strings. This occurs when the main character’s appendages, etc., are described as if moving all on their own. Two of these descriptions I see most often are with respect to hands and eyes. Now remember, Dane is our main character, so picture his description for a moment in your mind. If you were describing yourself...do you watch your hand rise all by itself without you knowing? Think about it, just sitting there while watching your own arm rise and your fingers wiggle and wave at you. Kinda freaky/creepy, right? Your hands don’t move all by themselves ➔YOU move them. Your arms don’t float up out of nowhere to wrap around someone➔YOU physically, purposefully raise your arms, wrap them around someone, and squeeze for a hug. YOU decide where you are going and physically lift and move your legs to walk there. These are conscious actions. Okay, maybe we don't think, Left foot, right foot, left foot, right foot, but we do actively perform the movement. Same goes for your character. The Fly POV Tells the reader what it sees--a hand moving. Deeper POV (Deeper Point of View) Shows the moments through your main character’s specific experience, consciously—actively— making the movement. As you can see, using stronger, active verbs helps to transform the sentence into Dane's specific perspective of the moment. B) There are always exceptions to the rules. Certain genres such as fantasy or horror, for instance, would lend to the odd, fantastic, magical and/or horrific descriptions where main character’s body parts are moving all on their own. But even in general contemporary, there may be certain moments when the main POV character might be traumatized, stunned, or in a fog or trance-like state depending on the scene (anything from a car accident to getting unexpected news) and wherein they are not fully aware of what is going on or “on automatic pilot” so to speak because their brain can’t cope with whatever event may have just happened. Simply ensure that these areas are described as such from the main character’s perspective of the emotional event so as to validate what might be considered disjointed body parts. But again, these situation are the exception, not the norm—make sure to use them sparingly, so when they do arise the action helps further the tension rather than focuses on an odd description of your character. Now, time to talk about those eyes. It is a basic, physical trait that eyes can’t leave their sockets. They don’t drop, rolling down your cheeks to clunk onto the floor, or leave the face to dart around the room, or pop out, etc. And glued to another set of eyes? Ewww, gross visual! Unless you are writing a horror story, not recommended at all. “Gaze” is a more appropriate, general term to use when describing visual movement of any character, not just the main one. Plus, there are plenty of better ways to add visual description including using stronger verbs. Dane’s honey-brown eyes grew round as his mouth dropped open, and his face turned red. General description of his surprise, right? So, how is this Fly POV you might be asking? Well, let’s try a little experiment…describe your eyes exactly as they appear in the light around you right now. No saying just the basics, either—I know they are blue, etc.—you need to describe exactly as they appear. Right. This. Moment. Can’t do it? Why? Ohhh, because you can’t actually see your own eyes, can you? Same with your main POV character—unless in front of a mirror or reflective surface, how can he or she see their own eyes, or face for that matter, to describe it? As we discussed last week, Deeper POV is simply staying in your character’s specific experience/perception—this includes only what they can see, hear, smell, touch, taste, or already know, etc. So, in this case, if he is not looking in a mirror then descriptions of eyes, face, facial expression, etc. shouldn't be described in visual detail. Don't fret, though, because there are ways to get around personal descriptions by using other sensory details instead. Even if they can’t see themselves, the main POV characters still experience the movement of the expression. Yes, "he smiled" or "she grinned" works if they are doing so purposefully, and describing the action, not the visual. But if it is more of a sudden, involuntary smile, then they can feel their lips tug up and/or lift their cheek in an involuntary smile. He or she can also quirk their lips if it is a purposeful, twisted grin reacting to something someone else said. As for a red face, this is more often than not from embarrassment or anger, and which is caused by a sensation of an overheated neck or burning cheeks (which causes the coloration someone else can observe on your character's face). Another quick side note: Try hard not to actually use the words “feel/felt” to describe sensory reaction as the use is often considered passive writing. You want to ensure the sensory description is active. Dane’s honey-brown eyes grew round as his mouth dropped open, and his face turned red. How did she find out? Dane gaped, his brows stretching his forehead as his cheeks heated. How did she find out? Just out of curiosity, did anyone notice the other example of this type of description revised in the swatted version we used earlier for Dane? The above concept of what the main character can and can't see, also goes for what he or she can or can't hear--voice descriptives. “Yeah, that’s what I thought,” she muttered and gave his chin a hard chuck before rising. One last, big buzz signal of Fly POV in main character descriptions is when he or she is grouped in with the masses—the women, the men, the cowboys, the ranch hands, etc. The Fly on the wall sees a group, that's all. The main character, however, is experiencing the moment in the group, so the observation needs to come from his or her specific perspective from within. This also goes for the use of "they" when including the main character. They stood or they walked hand in hand, for instance. Yes, the term can be handy, especially for quick transitions, but it can also be lazy Fly Telling when overused. So whenever possible, Show the main character's personal experience of the moment. With muscles groaning their complaints far beyond his thirty-two years, Dane heaved himself to a standing position. Similar to this is using a third party descriptive for the main POV character. 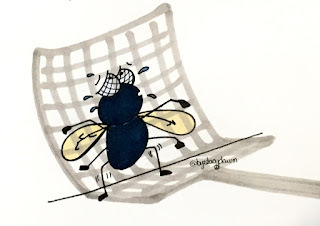 To sum up today’s post, don't let the Fly pull your character's strings. Swat right through them and let your main character Show the moment through his or her active experience. Pop back up and compare the very first example to this one and see how layering in Deeper POV--giving the main character the ability to Show his or her experience--can draw the reader in to experience the moment with them. Over the next week, try a quick "Find" in your manuscript for phrases such as “her hand” or “his hand” and “her eyes” or “his eyes” and “voice” or “tone” to check if the Fly is pulling the strings or not. Be sure to join me for the final part in the series: Demystifying Deeper POV Part Four: No-Fly Zone. And please keep spreading the word to join us here for some good old fashion swatting practice! Wow! Another great post, Stacy. Thank you so much for these mini lessons. They are so helpful and you make your examples very clear. Looking forward to next week's lesson. Thanks so much, C.B.! I really appreciate you coming out every week! I love that you remind folks about disembodied parts. I have a quirky sense of humor and I am often entertained by the images inadvertently presented. Thanks again for the great info! Thank you for your posts. The specific examples of what not to do help in preventing the fly on the wall from taking over. Excellent information. Thanks. Sent out the news. Thanks so much for spreading the word, Nightingale!! Love these posts on Deep POV. Thanks! It can be a difficult subject, but you make it easily understandable. I'm pinning this one! Hi, Louise. Thanks for asking and your interest!. On the right side of the blog, just below the Find Me section is a place where you can subscribe to the blog posts or sign up with your email so they should come directly to you by email when I post them.